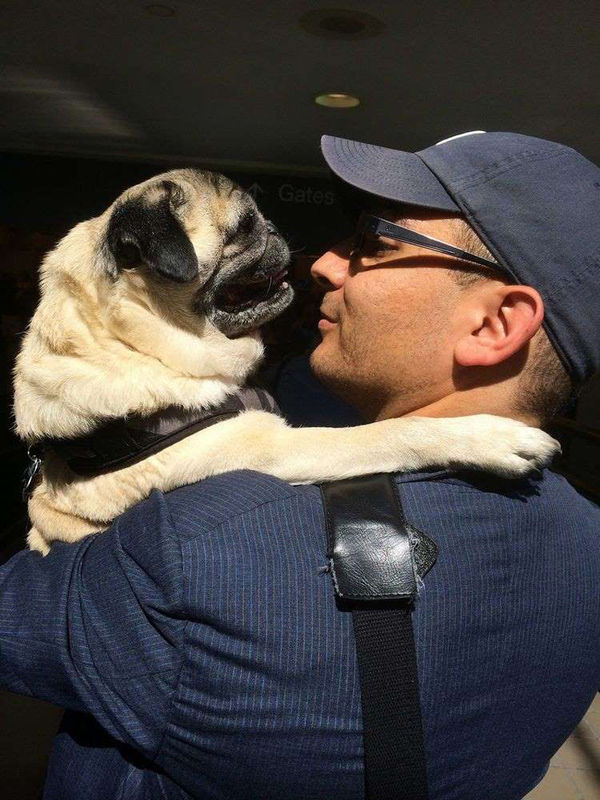 Shorty the senior pug and his owner Marc are a dynamic duo. “The relationship between Marc and Shorty is very special. Marc is Shorty’s person. He just adores him and is the happiest when he is in Marc’s arms. When he was younger, Shorty would travel with Marc everywhere, but it’s not possible now with his age. Marc calls Shorty his ‘angel’ dog. Shorty really taught Marc how to love and care for another living thing,” Marc’s wife, Kristen, tells PEOPLE. Together Kristen and Marc founded Vintage Pet Rescue in Rhode Island. At this non-profit, the couple provides hospice care and a loving home to senior and terminally-ill pets who have found themselves without a family. 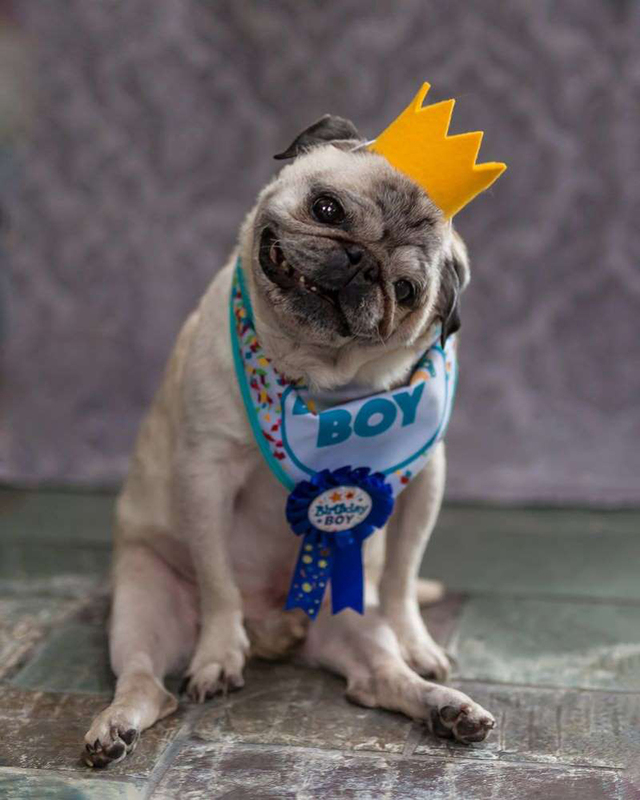 “We are currently home to 34 adorable senior pups who get 2 meals a day, lots of supervised outdoor time, hours of cuddles, and comprehensive medical care,” Kristen says. Fifteen-year-old Shorty, who Marc adopted when the pug was just a few years old, lives happily among his fellow grey-haired roommates. The only time Shorty has a bad day is when Marc travels for work. “Unfortunately, Marc has to travel a good amount for work and Shorty gets very anxious when he is away. Shorty will bark and cry and nothing will calm him down. He won’t even calm down if I am holding him. In the past, I tried putting one of Marc’s shirts on a pillow, but it didn’t really work. I felt so helpless trying to calm him down when Marc was away,” Kristen shares about Shorty, who is now too old to travel with his dad. While the pillow wrapped in Marc’s shirt didn’t provide much comfort, Kristen’s mom had another, more in-depth idea to help Shorty with his separation anxiety. “She was over one day and saw how upset Shorty was. That day she went home and ordered a life-size mannequin from a Halloween store. When she told me about it, I thought she was nuts! But, it was worth a shot,” Kristen says. 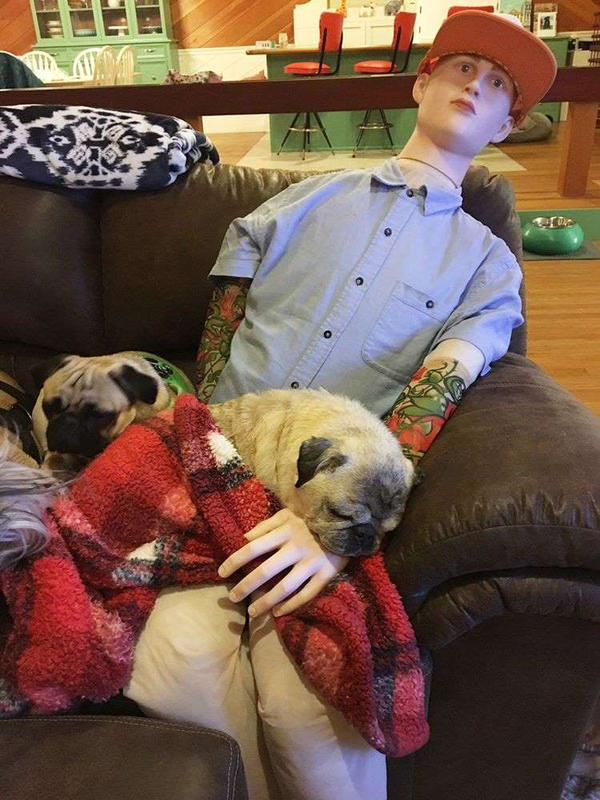 Kristen dubbed the mannequin Farc, short for “Fake-Marc,” and dressed the dummy in Marc’s already-worn shirts and hat, “so it would have his scent.” She also added fake tattoo sleeves to the mannequin, since Real-Marc has real tattoos on his arms. After getting Farc styled, Kristen sat the mannequin on the couched and waited to see what Shorty would do. “Shorty’s reaction was truly incredible. 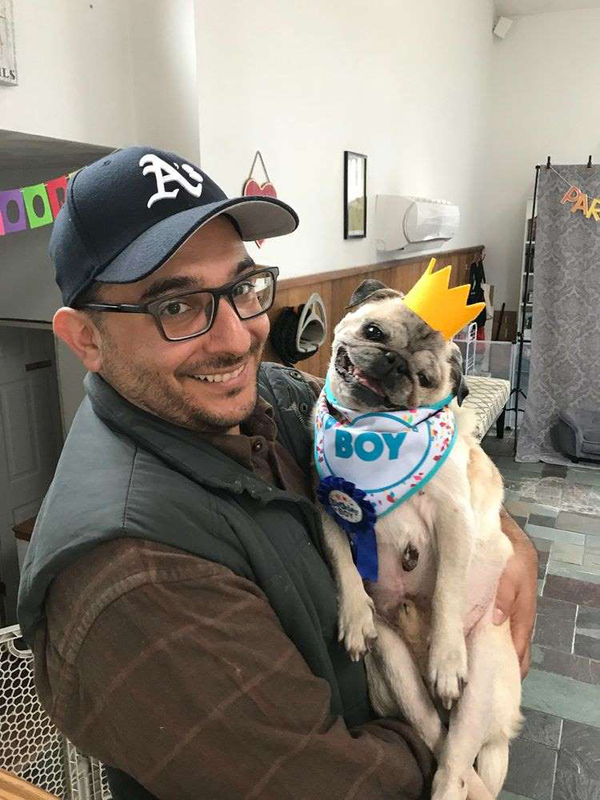 He had been crying and barking all day. I put him on Farc’s lap and wrapped the arms around him. He snuggled into the shirt and he was asleep within a half hour. He slept like that through the night. I was amazed. I really could not believe that it worked!” she says of the miracle-working mannequin. Shorty isn’t the only dog attracted to Farc’s allure. 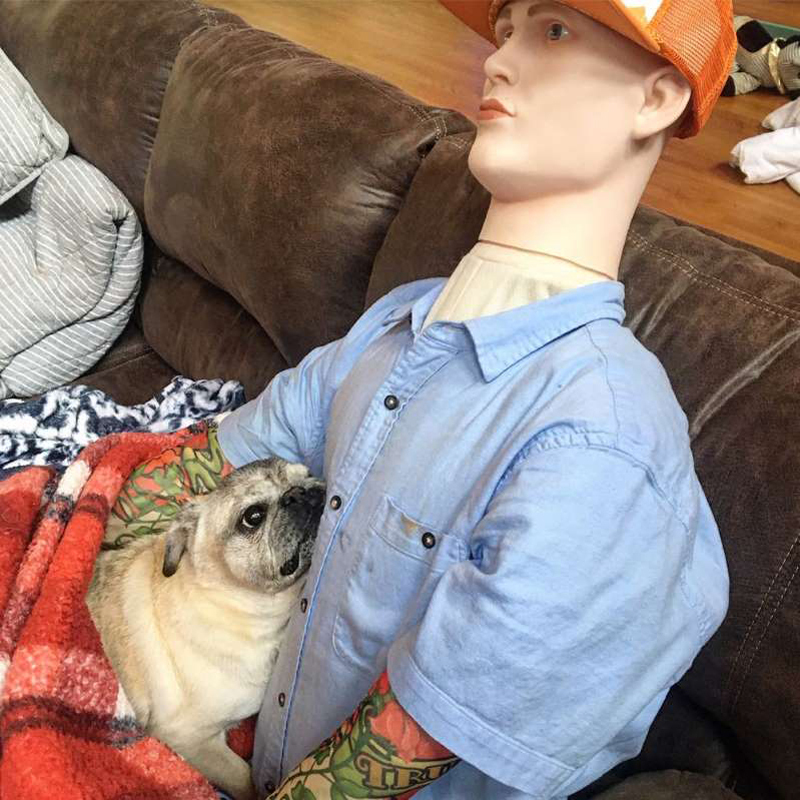 The dressed mannequin always has “one pup (or multiple pups) sitting on its lap or sitting at its feet.” Kristen says it’s likely Marc’s smell that all of the dogs, Shorty especially, are attracted to, but there’s something about the mannequin’s human form that truly makes a canine calmer. 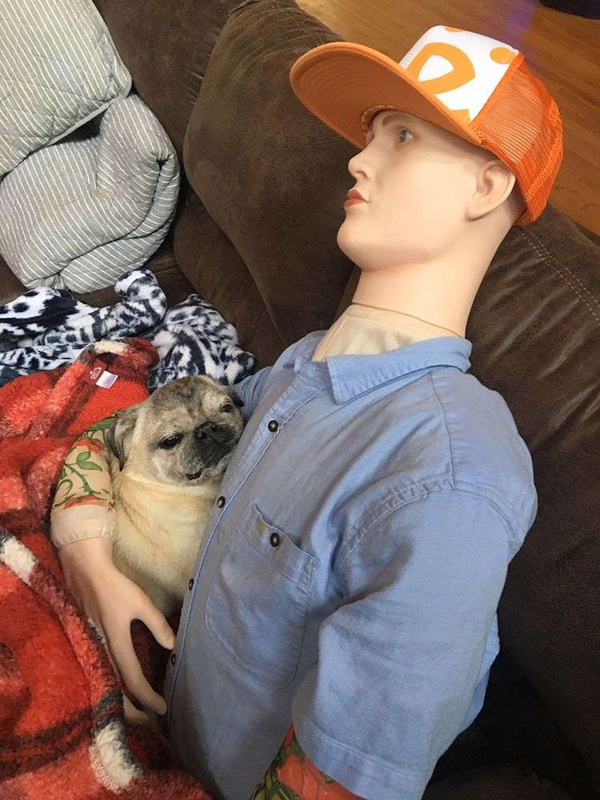 Real-Marc is a little hurt that Shorty could be fooled by “a brainless dummy,” but is mostly happy that his furry friend finally found a comforting way to cope with his separation anxiety. If you know a dog who suffers from the same stress as Shorty, Kristen says a mannequin might be the answer. 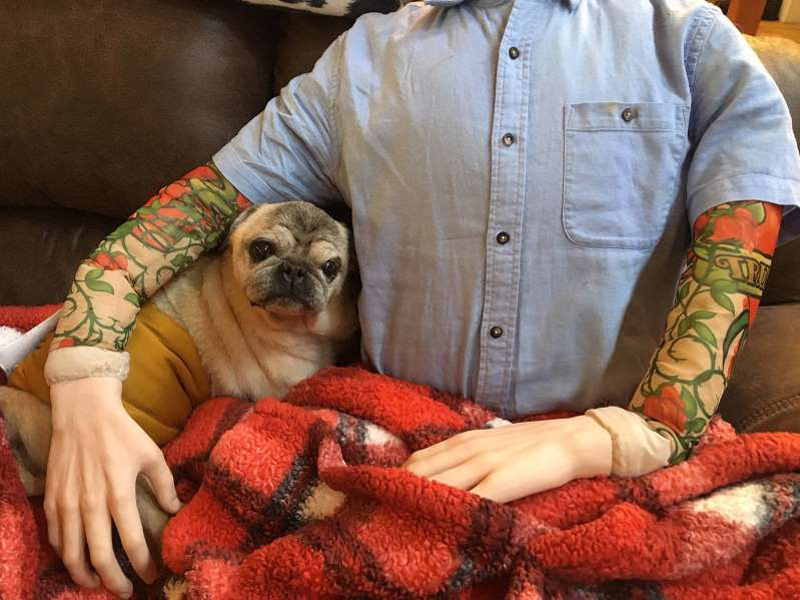 “Since posting Farc on social media I’ve had a few people reach out to me to tell me that they also bought a mannequin for their dog that has separation anxiety. I really think this might be a great thing for shelters!” she adds.